By Timothy G. Morgan, D.O., G. Lee Pride, M.D. A 75-year-old woman presented with long-standing mild proptosis and acute-onset dysphasia. A brain MRI was performed, demonstrating a left temporal lobe hemorrhage with surrounding edema and mass effect (not shown). Digital subtraction angiogram (DSA) revealed Type D bilateral carotid-cavernous fistulas (CCFs). Lateral DSA from a left common carotid artery (CCA) injection (A) shows abnormal communication between the cavernous sinus and branches from the external carotid artery (ECA, black arrow) and internal carotid artery (ICA, white arrow). Frontal DSA from a right CCA injection (B) shows left hemispheric cortical venous drainage (black arrow), likely explaining the patient’s left hemispheric hemorrhage. 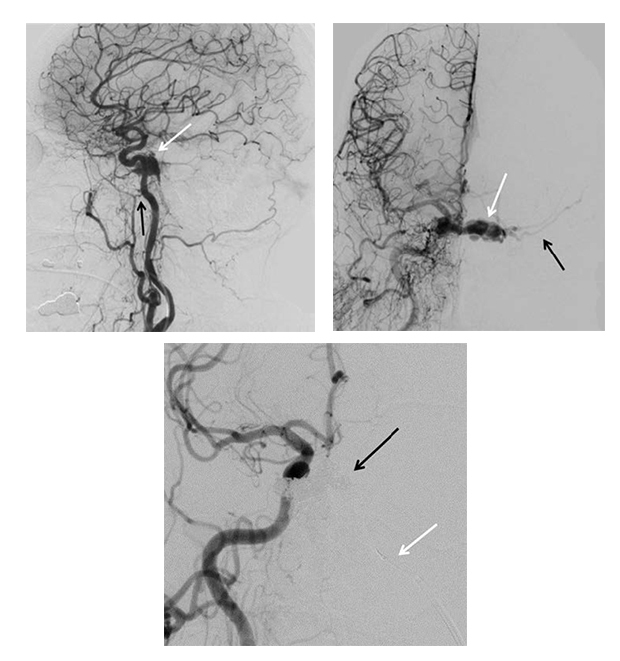 Bilateral CCA injections (right CCA image shown, C) depicts successful fistula occlusion by transvenous coil embolization (black arrow) across the intercavernous sinus from a left inferior petrosal sinus (white arrow) approach. A CCF represents an abnormal communication between the cavernous sinus and the carotid circulation, either indirectly from ECA and/or ICA branches or directly from the cavernous ICA. Indirect CCFs tend to present insidiously in post-menopausal women and are commonly misdiagnosed, thus delaying treatment. Direct CCFs most often result from head trauma and are more common in young men. CCFs can be classified into four types: Type A, direct fistula from ICA; Type B, indirect fistula from branches of the ICA; Type C, indirect fistula from branches of the ECA; and Type D, indirect fistula from branches of both the ICA and ECA. Diagnosis is often made by MRI/MRA or CTA and confirmed with DSA. Treatment consists of transarterial and/or transvenous embolization; surgical ligation is also an option. Spontaneous occlusion has been reported in low-flow indirect fistulas supportive. Morgan TG, Pride GL. At the Viewbox: Bilateral Indirect Carotid-Cavernous Fistulas. J Am Osteopath Coll Radiol. 2014;3(3):25. Timothy G. Morgan, D.O., G. Lee Pride, M.D. Drs. Morgan and Pride are with the Department of Radiology, University of Texas Southwestern Medical Center, Dallas, TX.